Perhaps one of the most commonly heard Passive House myths, is that you can’t open windows in Passive House buildings. This is wrong and it’s actually very important to have openable windows. Here are six reasons why. During warm periods, opening your windows is the easiest, cheapest and most effective way of cooling your building. 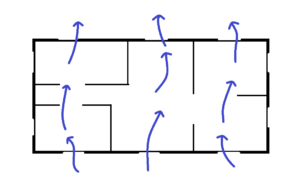 Opening windows on opposite sides of the building to allow natural breezes to pass through (cross ventilation) offers the most effective solution (at least in climates where temperatures are cooler at night). The standard air exchange provided by Passive House ventilation systems is generally far lower than cross ventilation. The cooling effect is further reduced by the additional heat being given off by the fan. The air change rates of ventilation systems during really hot (or cold) periods may not be high enough to keep the air from getting too humid (or too dry). A completely different type of ventilation system would be needed to allow for higher air change rates. Such systems would be more expensive and less efficient than existing systems. On the other hand, providing large volumes of air by opening your windows is fairly cheap. Windows offer a connection to the outside world, they allow you to hear the birds singing in the morning or call out to the kids in the garden. Most building users therefore expect to have openable windows and want to be able to choose whether to open them or not. Cleaning fixed windows is usually much more difficult than cleaning windows that can be opened and cleaned from the inside. In Europe, most windows are tilt and turn, allowing the user to swing them in like a door and easily clean the outside window pane. If a building is mostly fitted with inside opening windows it can help make it much easier to maintain and can help reduce running costs. *Assuming windows can be fully opened to the inside. Outward opening windows would be more difficult to clean. Monitoring results suggest that there is little risk of Passive House buildings getting too warm or requiring significantly more heating energy due to users keeping their windows open. There is no need to fear that human errors might cause problems. Even when users tilt bedroom windows all night in winter, the only negative effect is a slight increase in heating energy use (see Passipedia article on user behaviour). Even when it’s cold it may be nice to be able to open the windows to let some fresh air in, for example during a party or a large meeting. 6. An openable window could save your life! Last but not least, an openable window could save your life as it offers an easy escape route in the event of a fire or other emergency. 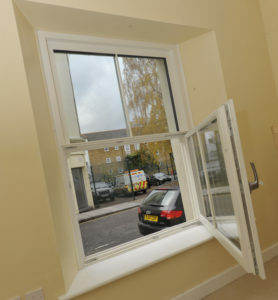 To sum up, there are very few Passive House buildings that have been partially or entirely fitted with fixed windows. Most reports or enquiries regarding these buildings concern complaints about excessive temperatures in summer or users feeling closed in – something that can be prevented with tilt and turn windows. Based on these reasons and experiences, providing at least one openable window per room used for living is a prerequisite for Passive House buildings eligible for certification. There might be well justified exceptions for example if the building is located directly next to an airport or in an extreme climate zone. Adapted from the original article on Passipedia. cooling, myth, passive house, windows. Bookmark.